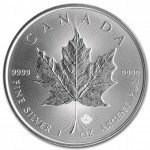 Any quantity only $19.20 per oz over spot! The bison holds a special place in the history of North America. One of the largest land animals to ever roam the continent, the bison contributed to the early health and survival of native tribes and settlers alike. The Royal Canadian Mint has unveiled a new design for bison coins on the 2015 1.25 oz $8 Silver Canadian Bison. 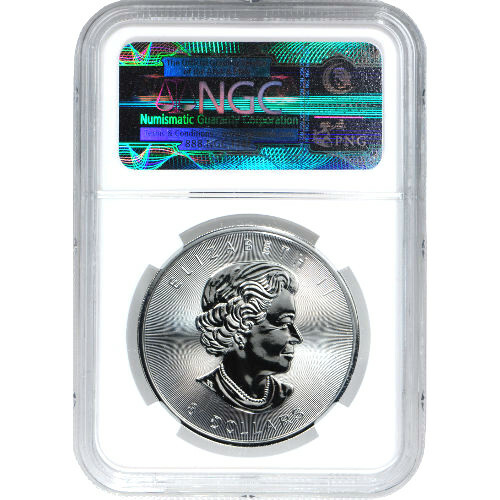 You can now own this coin from Silver.com, complete with an NGC rating of MS69 from the mint’s early release collection of coins. Contains 1 oz .9999 pure silver. Minted by the Royal Canadian Mint. Carries a $8 CAD face value backed by the Canadian government. Graded a near-perfect MS69 by the NGC. Part of the Early Release series. Ships in an NGC plastic slab. 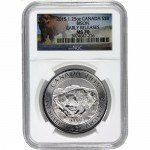 The Royal Canadian Mint’s new 2015 1.25 oz $8 Silver Canadian Bison Coins feature a brand new design on the reverse side, new security features, and quality certifications from the Numismatic Guaranty Corporation. Each coin in the series has new radial lines around the rim on both sides. The design is meant to inhibit counterfeiting of the coin with the help of micron-level machining. 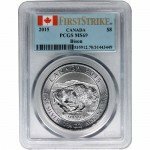 These particular 2015 1.25 oz $8 Silver Canadian Bison Coins have been certified by the Numismatic Guaranty Corporation as MS69. Such a grading means the coins have an attractive and sharp strike, with minimal loss of luster of mint and year marks. 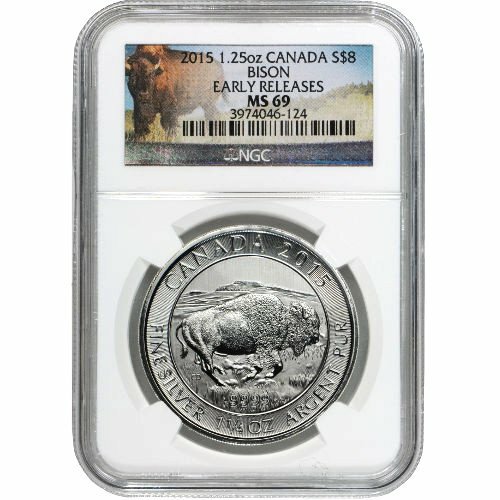 On the reverse side of the 2015 1.25 oz $8 Silver Canadian Bison Coins is the new image of a bison. In the image, a lone bison gallops through an open field on the Canadian plains. Engravings include “Canada 2015” and the weight, purity, and metal content of the coin. The obverse side bears Susana Blunt’s right-profile portrait of Queen Elizabeth II. Engravings on this side include “Elizabeth II” and the face value of the coin in Canadian dollars. The Royal Canadian Mint has operated in Ottawa since 1908 when the first facility was opened to handle gold sourced from the Yukon Territories. An additional facility has since been opened in Winnipeg, with both serving the government of Canada as the sole producer of circulation and commemorative coins for the nation. Silver.com wants your shopping experience to be as pleasant as possible. When you have questions about our products or the purchasing process, you need only pick up the phone and call our associates at 888-989-7223, or connect with us through the live web chat on our site.